This is the official back-to-school day for contemporary art in L.A. 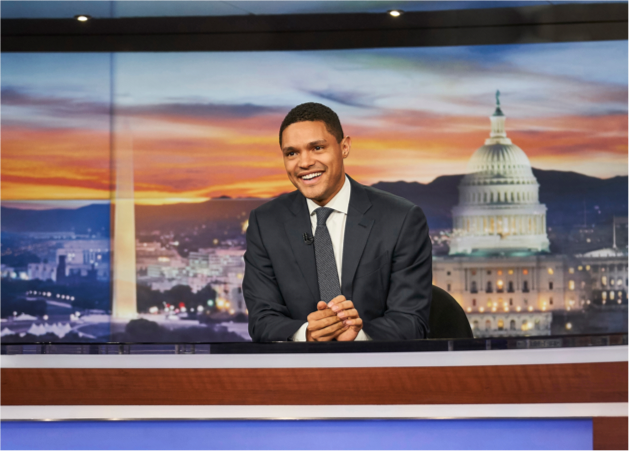 There are dozens of gallery and museum openings in the next few weeks and one recurring theme: Political awareness and activism. Here are a few that are not to be missed. One of the most active political artists of recent years is the well-known Chinese dissident Ai Weiwei, who now lives in Berlin. This fall offers an unprecedented opportunity to see his work in L.A. at three different locations. 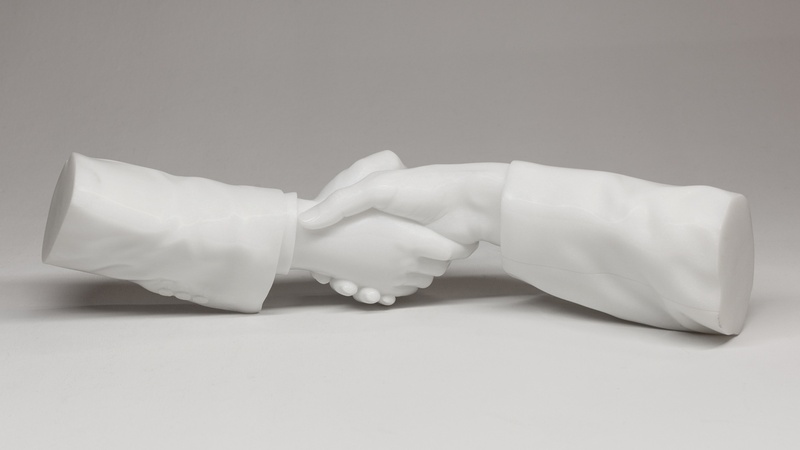 The largest will be at the Marciano Art Foundation from Sept. 28. Life Cycle offers his sculptural response to the global refugee crisis. Along with that substantial new work based on migrant’s small boats, the exhibition will present other pieces works including his acclaimed Spouts (2015), thousands of antique teapot spouts that are dated to the Song dynasty (960 – 1279). This is the first time that installation has been exhibited in its entirety. Another exhibition is being held at UTA Artist Space, which had Ai Weiwei design their renovated warehouse space in Beverly Hills. Cao/Humanity includes an ongoing performance whereby visitors can be recorded reading from the artist’s book Humanity, messages that will be presented in video and online as an invitation to involve people of all backgrounds and origins. 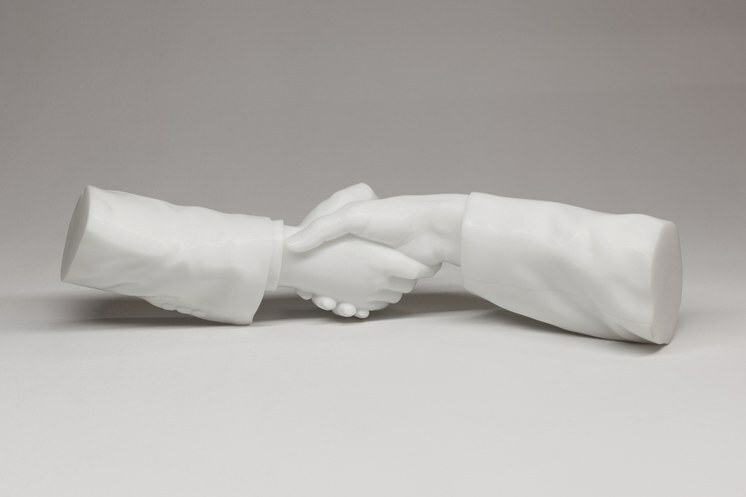 Ai Weiwei, Hands without Bodies, 2018. Marble. 13 x 17 x 57.4 cm. Courtesy the artist and UTA Artist Space. Throughout the space, a survey of sculpture and other work by the artist includes an expanse of carved marble grass tufts on the floor, Cao (2014), a word that has provocative double meaning in Chinese. That show opens on Oct. 4. 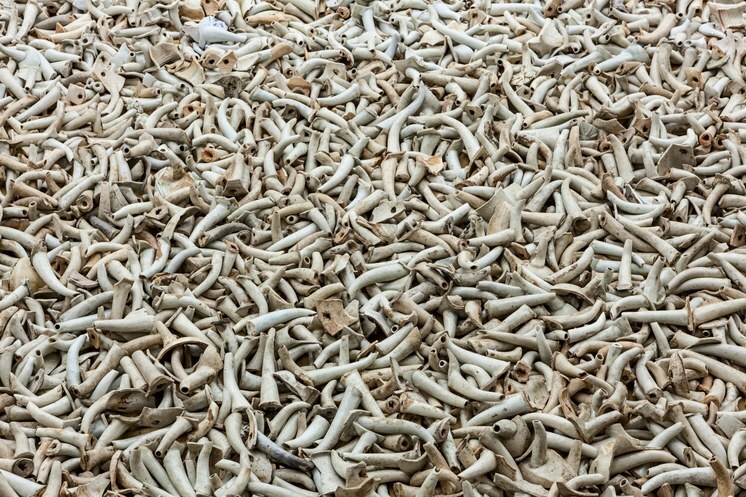 In addition, work by Ai Weiwei will be on view at the new Hollywood gallery of Jeffrey Deitch, the controversial ex- director of Moca. The Hammer features Adrian Piper: Concepts and Intuitions, 1965-2016 from Oct 7. This is a wide-ranging retrospective of the Berlin-based artist long respected for her use of photography and performance in the early years of conceptual art to bring up complex issues around civil rights, gender and race. There will be a series of performance-based activities throughout the exhibition and other works at the ICA downtown. 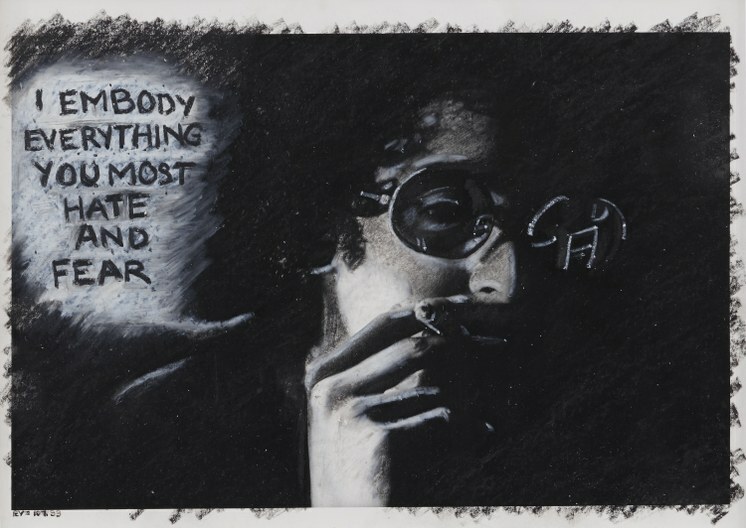 Adrian Piper, The Mythic Being: I Embody Everything You Most Hate and Fear, 1975. Oil crayon on gelatin silver print. 8 x 10 in. (20.3 x 25.4 cm). Collection Thomas Erben, New York. © Adrian Piper Research Archive Foundation Berlin. But what about this weekend of art openings? 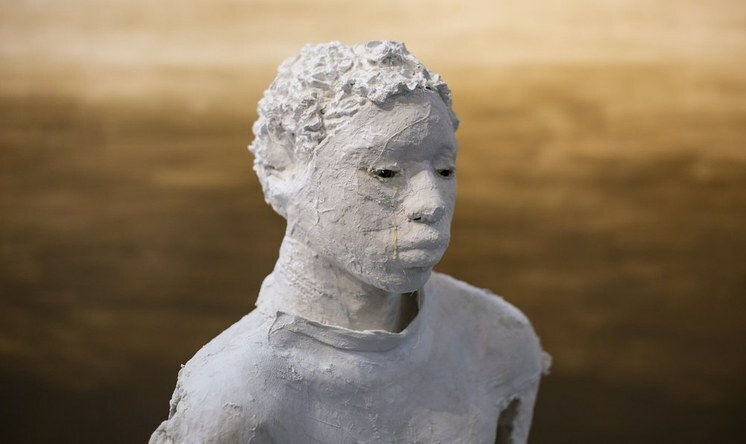 Wilding/Cran in downtown L.A. opens on Saturday with show of the plaster figurative sculptures of Karon Davis. Muddy Water is based on the 1927 Bessie Smith song about the Great Mississippi Flood but with references to floods and other natural disasters of recent years due to climate change. With her late husband Noah Davis, she is a founder of the Underground Museum, their home-grown institution offering contemporary art access to the neighboring West Adams and Arlington Heights communities. In Boyle Heights - Edith Baumann at Parrasch Heijnen. In Hollywood - Lari Pittman at Regen Projects, Olafur Eliasson at Tanya Bonakdar, Frank Stella and Thomas Scheibitz at Spruth Magers, Fiona Conner at 1301PE. On the West side - Sharon Ellis at Christopher Grimes and Jerry McMillan at Craig Krull.